"Forwarding agent" redirects here. For the concept used prior to the modern postal system, see Forwarding agent (philately). This article is about freight forwarders. For companies which forward mail and parcels but not cargo, see Commercial mail receiving agency. 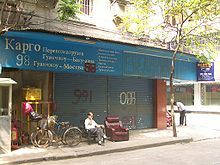 The storefront of one of many freight forwarders located around Guangzhou's garment districts. The list of destinations indicates that this business serves importers of Chinese clothes to countries such as Russia and Azerbaijan. A freight forwarder, forwarder, or forwarding agent, also known as a non-vessel operating common carrier (NVOCC), is a person or company that organizes shipments for individuals or corporations to get goods from the manufacturer or producer to a market, customer or final point of distribution. Forwarders contract with a carrier or often multiple carriers to move the goods. A forwarder does not move the goods but acts as an expert in the logistics network. These carriers can use a variety of shipping modes, including ships, airplanes, trucks, and railroads, and often do utilize multiple modes for a single shipment. For example, the freight forwarder may arrange to have cargo moved from a plant to an airport by truck, flown to the destination city, then moved from the airport to a customer's building by another truck. International freight forwarders typically handle international shipments and have additional expertise in preparing and processing customs documentation and performing activities pertaining to international shipments. Information typically reviewed by a freight forwarder includes the commercial invoice, shipper's export declaration, bill of lading and other documents required by the carrier or country of export, import, and/or transshipment. Much of this information is now processed in a paperless environment. The FIATA shorthand description of the freight forwarder as the "Architect of Transport" illustrates the commercial position of the forwarder relative to its client. In Europe, some forwarders specialize in "niche" areas such as rail-freight, and collection and deliveries around a large port. One of the earliest freight forwarders was Thomas Meadows and Company Limited of London, England, established in 1836. According to "Understanding the Freight Business," written and published by the executive staff of Thomas Meadows and Company in 1972, the advent of reliable rail transport and steamships created demand for the fledgling freight forwarding industry. Trade developed between Europe and North America, creating additional demand. The first international freight forwarders were innkeepers in London who held and re-forwarded the personal effects of their hotel guests. The original function of the forwarder was to arrange for carriage by contracting with various carriers. Forwarder responsibilities included advice on documentation and customs requirements in the country of destination. His correspondent agent overseas looked after his customers' goods and kept him informed about matters that would affect the movement of goods. In modern times, the forwarder accepts the same responsibilities. It operates either as a domestic carrier or otherwise with a corresponding agent overseas or with his own branch-office. In a single transaction, the forwarder may be acting as a carrier (principal) or as an agent for his customer or both. International freight forwarders, NVOCCs, and customs brokers often charge for transferring documents to another transportation company at the destination. This fee is a part of the ocean freight charges, being paid by the importer at the port of discharge in the International Commercial Term (incoterm) FOB (free on board), and by the exporter at the origin in the incoterms CFR (cost and freight) and CIF (cost, insurance and freight). This fee is separate from documentation fees charged by carriers and NVOCCs as part of the freight charges on a bill of lading and is separate from other fees for document preparation or for the release of cargo. In Australia most licensed Customs Clearance Agents (commonly referred to as Customs Brokers) operate under a freight forwarder. Freight forwarders must have a government license. Transport Canada is the federal department responsible for implementing and enforcing transportation policies and programs. The Canada Border Services Agency is responsible for enforcing most regulations that affect international freight forwarders. International security measures are the dominant concern. The Canadian International Freight Forwarders Association (CIFFA) was established in 1948 to support and protect the character, status, and interest of foreign freight forwarders by establishing uniform trade practice and regulations. CIFFA also plays an educational role by providing certificate and advanced certificate programs. Federation of Freight Forwarders’ Associations in India (FFFAI)  is the Apex Body and the Sole Representative of 28 Member Associations from all over India representing 6500 Custom House Agents (employing over 110,000 people). International merchandise trade is worth €148 billion to the Irish economy. 82% of manufactured products are exported, further highlighting the importance of freight forwarders to the national economy. Associations including the Irish International Freight Association and FIATA help maintain the professionalism of this industry through educational and representative roles. FIATA offers a Diploma in Freight Forwarding. In Kenya and Tanzania freight forwarders are commonly referred to as clearing and forwarding agents. A license is required, which can be acquired from Kenya Revenue Authority and Tanzania Revenue Authority respectively. Freight forwarders in Kenya and Tanzania are responsible for clearing consignments through Kenya and Tanzania customs, arranging transportation and forwarding the consignment to the consignee. Both exports and imports must clear customs in Kenya/ Tanzania. Freight-forwarding in Nigeria has been in place since the exporting of groundnut as a cash crop beginning in 1914, though not initially as freight forwarding but as the means of transportation of goods and services from one country to another. Following the methodology of their British forebears, agents were used to facilitating the transport of goods and services. Pakistan International Freight Forwarders Association PIFFA has more than 500 freight forwarding companies as members. The association is registered with the Ministry of Commerce, Govt. of Pakistan, and aims to provide effective representation and support for Pakistan freight services industry to observe the highest standards of professional competence. PIFFA also contributes to educating the freight forwarders by offering short courses and internationally recognized Diploma validated by FIATA. PIFFA is the local representative of FIATA and member association for Pakistan. In the U.K., freight forwarders are not licensed, but many are members of BIFA (The British International Freight Association). BIFA is the trade association for UK-registered companies engaged in the international movement of freight by all modes of transport, air, road, rail, and sea. BIFA has around 1500 corporate members, known generally as freight forwarders, who offer a wide range of services within these various modes. Companies that handle domestic U.S. freight by road must be registered with the U.S. Department of Transportation's Federal Motor Carrier Safety Administration. Such forwarders are "carriers" who accept freight for transport and are liable for delivering the freight under their own bill of lading. International ocean freight forwarders arranging for shipments to and from the US must be licensed by the Federal Maritime Commission as Ocean Transportation Intermediaries. An Ocean Transportation Intermediary is either an ocean freight forwarder or a non-vessel-operating common carrier (NVOCC). An ocean freight forwarder is "an individual or company in the United States that dispatches shipments from the United States via common carriers and books or otherwise arranges space for those shipments on behalf of shippers; ocean freight forwarders prepare and process documentation and perform related activities pertaining to shipments." An NVOCC is "a common carrier that holds itself out to the public to provide ocean transportation, issues its own bills of lading or equivalent documents, but does not operate the vessels that transport cargo"; or, "a shipper in its relationship with the vessel-operating common carrier involved in the movement of cargo." ^ "Freight forwarder." Random House Unabridged Dictionary (1997). Random House, Inc., on Info, please. Retrieved 21 December 2012. ^ "europa road". Europa-road. 17 April 2018. ^ "Federation of Freight Forwarders' Associations in India (FFFAI)". FFFAI. ^ The legal definition at 49 U.S.C. § 13102 (8) is: "Freight Forwarder—the term 'freight forwarder' means a person holding itself out to the general public (other than as a pipeline, rail, motor, or water carrier) to provide transportation of property for compensation and in the ordinary course of its business — (A) assembles and consolidates, or provides for assembling and consolidating, shipments and performs or provides for break-bulk and distribution operations of the shipments; (B) assumes responsibility for the transportation from the place of receipt to the place of destination; and (C) uses for any part of the transportation a [surface carrier] carrier subject to jurisdiction [of the Department of Transportation] of under this subtitle." ^ "Office of Transportation Intermediaries". Federal Maritime Commission. U.S. Government. Retrieved 2016-04-20. ^ a b "Ocean Transportation Intermediaries". Federal Maritime Commission. U.S. Government. Retrieved 2016-04-20. This page was last edited on 23 March 2019, at 13:01 (UTC).